CNS photo/MGM Dwayne Johnson stars in a scene from the movie "Fighting With My Family." The Catholic News Service classification is A-III -- adults. The Motion Picture Association of America rating is PG-13 -- parents strongly cautioned. Some material may be inappropriate for children under 13. NEW YORK — You can’t judge a book by its cover — or, in this case, a film by its title. “Fighting With My Family” (MGM) turns out to be an entertaining comedy-drama despite its off-putting name. Florence Pugh stars as Saraya-Jade Bevis, who competed under the name “Paige” and became a superstar of the World Wrestling Entertainment (WWE) empire. In 2014, at age 21, she won the “Divas Championship,” becoming the youngest female champ in WWE history. One could say wrestling is in Paige’s DNA. Her parents, Julia (Lena Headey) and Ricky (Nick Frost), are former wrestlers who now manage a carnival-like wrestling show. They raised their children to regard the sport as their veritable lifeblood — and a ticket out of poverty. Pressed by their parents to go for glory, Zak and Paige travel to London, where the WWE holds a tryout for wannabe stars, overseen by gruff trainer Hutch (Vince Vaughn). 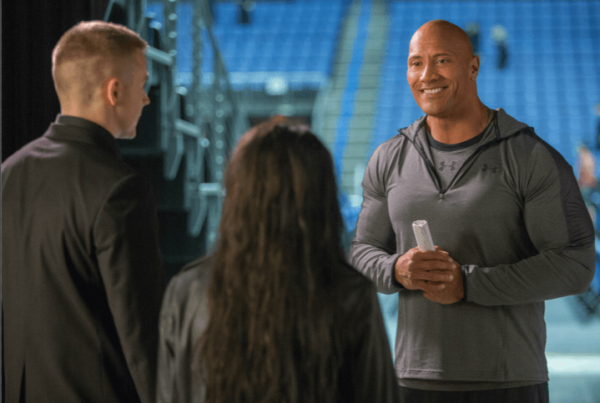 There they meet their idol, real-life former WWE superstar Dwayne “The Rock” Johnson (playing himself), who offers sound advice. Writer-director Stephen Merchant channels the “Rocky” films in this rousing underdog tale. The seemingly insurmountable challenges test Paige’s faith in herself and that of her anxious family back home. The rough edges of “Fighting With My Family,” including streetwise cursing and sexual banter, place the movie out of bounds for younger viewers. An exception might be made, however, for mature adolescents who would benefit from this uplifting picture’s positive messages about perseverance, forgiveness and the bonds of friendship and family. The film contains occasionally violent wrestling action, an out-of-wedlock pregnancy, drug references, sexual innuendo and some profane and crude language. The Catholic News Service classification is A-III — adults. The Motion Picture Association of America rating is PG-13 — parents strongly cautioned. Some material may be inappropriate for children under 13.